A Tennessee Walking Horse competes in the annual celebration in Shelbyville, Tenn. 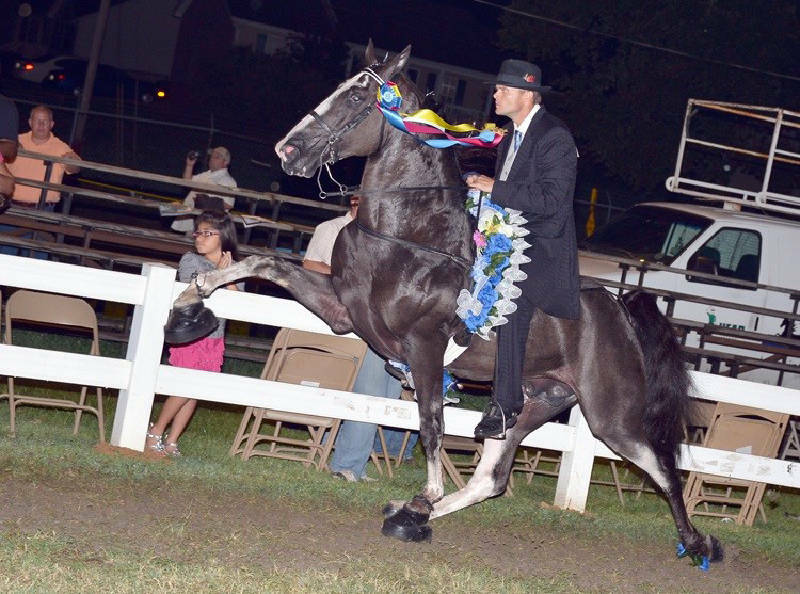 The 75th annual Tennessee Walking Horse National Celebration's 11-day championship shows begin today in Shelbyville, Tenn. This year's Celebration is an anniversary event, but -- unexpectedly -- it also represents a new day in the walking horse industry. Like it or not, the Celebration's walking horse world is being dragged into compliance with new federal rules adopted in 2012 that prescribe mandatory punishments for trainers who sore horses and horse owners who allow it. It's a victory for the beautiful, gentle Tennessee walking horses and their admirers. Hopefully it will not be the last victory for this incredible breed and wonderful icon of Tennessee. The U.S. Department of Agriculture, charged with enforcing the Horse Protection Act, inspects at about 11 percent of walking horse shows for signs of soring -- the use of caustic chemicals or objects to make the naturally gaited walking horses step still higher and further to achieve what's become known as the "big lick." Because the USDA does not have enough veterinary inspectors for every show in the $1.4 billion industry, the USDA trains lay inspectors in federally approved horse organizations. Those lay inspectors, made up of people in the industry itself, statistically have not proven to be as exacting as federal overseers. So last year, USDA adopted tough new rules for those organizations and the lay inspectors. Among the new rules are mandatory penalties for the trainers and -- for the first time ever -- owners of horses found to be sored. But the Celebration's inspection group, called SHOW, refused to sign on to the new rules. USDA then began the process of pulling SHOW's certification, and soon afterward SHOW sued USDA, claiming the new regulations violated horse trainers' rights to due process. A federal judge last month ruled in favor of the government. So on Monday, two days before the Celebration was to begin, SHOW issued a statement saying it would adopt the minimum penalty protocol and those new sanctions will be in force at this year's Celebration. "SHOW agrees with penalties, and since its inception in 2009 has had the harshest penalties in the industry. We did however disagree with the rule because we believed it would have a negative impact on the reform movement now taking hold in the industry," said a SHOW spokesperson on Monday. Still reeling from the public outcry at former Hall of Fame trainer Jackie McConnell's filmed cruelty to horses -- shown last year on prime time television in an undercover surveillance video -- and his subsequent guilty plea and federal conviction, the Celebration's CEO Mike Inman has already said ticket sales and walking horse entries this year are suffering. SHOW's adoption of the new rules likely will decrease the entries still more, as trainers and owners will now think twice about the potential for being disqualified from working for extended periods -- two weeks a year. Tennessee walking horses and walking horse shows haven't always suffered this stigma of shame. Only in the last four decades or so has greed taken what used to be a real celebration of smooth walkers and turned the beauties into jerky robots with far-oversized front hooves. But good owners and good trainers are still out there. These newest rules, along with newly proposed amendments to the Horse Protection Act, will level the track again for those good horsemen and horsewomen who understand that "mustard wraps" and chains to rub chemically sored legs and oversized pads to hide deliberately painful horseshoeing are just shortcuts, not real horsemanship. To be fair, many of the 1,849 horses that Celebration officials said were presented for competition last year were not "performance" horses wearing big pads and/or chains. But almost all contending in the world champion events of the Celebration's final hours near Labor Day were. Last year only 9 percent of Celebration entrants were found in violation of soring rules, according to a then-Celebration spokeswoman. But USDA, which steps up its own inspectionsfor the 11-day event, reported that federal testing in the final days of the event revealed that 145 horses out of 190, or 76 percent, tested positive for prohibited foreign substances used in soring. These horses are magnificent athletes. It's heartbreaking that so many of their trainers would seem to be the equivalent of dopers. Perhaps at the 100th Celebration, the industry will have recovered from this pathetic legacy.